It has been a while since my last skincare item review. Today I wanted to briefly talk about the cleansing oil that I am currently using on a daily basis. For a long time, Shiseido fitit Perfect Oil had been my staple. I was quite happy with the light consistency of the oil and its performance. However, I have noticed the price has been marked up significantly to the point where using this drugstore product loses its merits. I decided to try this higher-end yet reasonably priced cleansing oil when beauty.com was running a 20% off sale. After a quick calculation, I found out this is indeed a nice deal. Additional to its reasonable price, the cleansing oil itself is pretty nice as well. 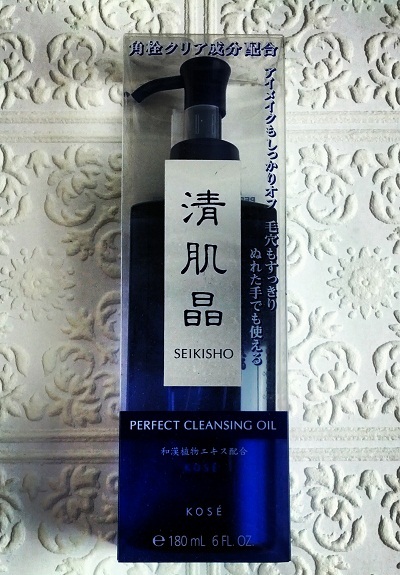 I like that Seikisho Perfect Cleansing Oil.. Here is the ingredient list for you. I am already on my third bottle and I plan to keep using this unless something much better comes along. Have you tried this cleansing oil? What do you think about oil cleansing methods in general? I always switch up to using cleansing oil right when Winter rolls around where I live. I'm currently using the Shiseido one you used before, but definitely will have to look for another one as it apparently has been discontinued as well! I'll try this one out :) Thanks Lena! oh i didn't know the shiseido one has been discontinued. i still see them on line. just that they got so expensive! I haven't tried cleansing oils, period, Lena. I guess it's because I always thought that oil + oily skin= not good. So I've just stayed away. i was just like you and i still make sure i use foaming cleanser after. i use waterproof makeup daily so removing it effectively with minimal irritation is very important for me. cleansing oil does a great job and some oil can help minimize blackheads as well. lately the study shows mineral oil is less likely to clog pores (it has bigger particles) and doesn't oxidize on skin, so it could be beneficial if used correctly. I love cleansing oils, my HG was fancl but I got breakouts from this oil somehow, then I stopped using it and tried it after a while and it was ok. But now I am still looking for a good cleansing oil. I really like the japanese cleansing oils though. I also broke out from this kose oil *sigh*. ah, too bad this didn't work out for you, Claire. some people are just allergic to mineral oil. maybe you should look for something with natural oil, then. I remember I used a lot of Kose skin care products on my teenage years in Indonesia.. Kose is easily accessible there, unlike here in Germany..
i liked kose drugstore version if whitening line as well. I use a Clinique cleansing milk, which I like a lot for removing makeup. I've also tried Boscia's cleansing oil, which is also nice. I think oils and milks feel better on the skin for removing makeup! i still follow up with foaming cleanser, though. korean brands have nice ones as well. the problem is the marked up price and the shipping! I haven't tried it, but need to Lena! Your skin is beautiful! Thanks for the suggestion! i agree! i love drugstore cleansing oil, too. Is it works for oily skin too? i have oily t-zon, too. i think oil cleanser could be better for oily skin if used correctly. this has emulsifier so rinses well and i always follow up with foaming cleanser. I have not tried Kose cleansing product before but I have heard few people saying that this is a good product. My current go to cleansing oil is Neutrogena & Shu Uemura. Neutrogena is the one that I reached the most as it's much more affordable and cleanse perfectly too. oh i didn't know neutrogena has oil cleanser! i will look for that. i go through oil very quickly and i am always on a look out for affordable one! I have never used a cleansing oil before :) Is mineral oil the same as baby oil? I wanna try this oil since so much time!! Thank you for this review!! I'm using Sephora's oil but I don't like a lot this product. it is really nice oil for its price. Tag : What's in my makeup bag?